copter wrote: ↑ And yes, I have like n+x times checked that I have soldered everything properly, Data goes to PD0 and Clock into PD1. What about Vcc? Does the Micro deliver 5V to the keyboard or did you accidentially connect the 3.3V line (directly next to it, if a quick glance at the schematic told me correctly)? Because - when connected, at least the M2 should light up all 3 LEDs as part of the BAT. Definitely not only 2 of them (that's normally the "bad capacitor symptom"). I can double check this. I'm not currently at my workshop, but I'm pretty sure that I connected VCC into 5V line next to ground. Skidata has internal beeper, which I can also hear to beep when keyboard is connected. When pressing the keys and lookind hid_listen I can still see that when I press key, I get something and it stops after the keypress. To me it seems like I'm just getting something from the keyboard which is not translated properly. I first thought that I have a wiring problem, but checked them many times. 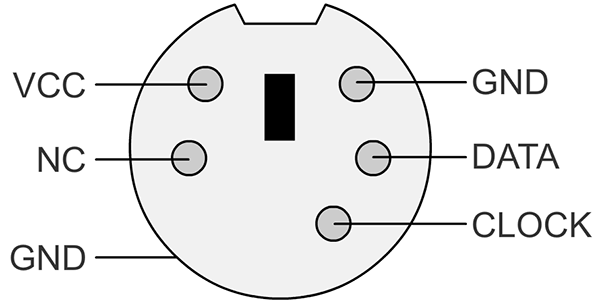 In Soarer documentation pins are described from the outside of the port -> mirrored horizontally from the actual connections at the back. I did check this many times, wondered that maybe I should try reversing the order anyway, but as I got the voltage to the leds and heard the beeper, I thought they must be right as there is some logic still how this works. I guess _if_ data and clock would be crossed, the symptoms would be very different. Anyway I will get back to my workshop later with some third PS/2 keyboard and computer that has PS/2 output, then hopefully I'm able to solve what's happening here. I was wondering that could this be a driver problem in Windows? Driver issues are unlikely. Unless you installed a different driver that might impact a converter, such as a control panel for a gaming keyboard. We'll see. I did use some USB PS/2 adapter in that computer earlier, so just wondered that if it installed some drivers that might mess up. Anyway all Soarer tools are working like they should. Ended up finding a dead ps/2 mouse, snapping off the pin (that's blocked off on the keyboards socket) and wiring the other end to the teensy. Once connected as per the instructions it works just fine minus a bunch of keys being wrongly mapped or not working, I mapped out the entire keyboard and corrected this, config file for getting the keyboard 99% working is attached, the 1% "not working" is just keys that i replaced with ones not physically present on the board, such as F11, F12, winkey etc. You can also find the full keymap here - http://i.imgur.com/GWgZeqn.png. Main keyboard: IBM SSK (Bolt mod and ISO), rgb + red esc. Favorite switch: Model F capacitive. After almost 5 years of exposed circuitry I finaly got around to print myself a case for my adapter (No more accidental short circuits Yey!). The slot for the Teensy ended up being slightly too small so it has to be mounted at an angle, doesn't move though . On the other hand the 5 pol 240 deg female press fits just right . G80-1800 and AT->PS/2 adapter for scale. 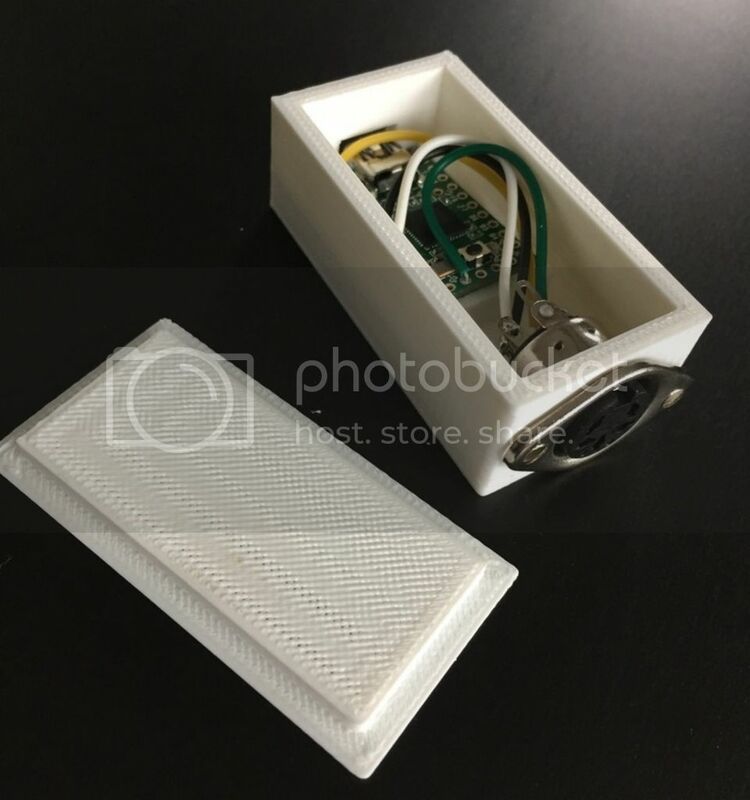 Mikelittoris wrote: ↑ After almost 5 years of exposed circuitry I finaly got around to print myself a case for my adapter (No more accidental short circuits Yey!). The slot for the Teensy ended up being slightly too small so it has to be mounted at an angle, doesn't move though . On the other hand the 5 pol 240 deg female press fits just right . That looks super clean. I've been thinking of picking up a 3d printer for exactly this type of project. I must confess though, I'd really like to be able to print a 60% case in one pass and I'm having trouble finding a decent printer for it b/c i live in a small apartment and it's not really practical to have. Nice, that's what I need to do also. I keep on failing by not finding the right container though. I have built several enclosures. First, I used plastic project boxes that were usually unsuccessful due to cracking when I drilled relatively large holes in relatively small areas. Now, I have a current "testing" box with 4 connection types built in a residential wiring box, and 2 aluminum project boxes. The one with both larger DIN sizes is comfortable to work in but rather large and heavy. The small one, which I consider perfect, is about as small as you can go with a standard Teensy. So, I have a BTC5100 which fn-key placement really bothers me. The key does not seem to output any codes by itself (tested using xinput in Linux); I guess that means I can't use a Soarer-based converter to remap it? I.e. switch the positions of fn and ctrl. Hi, I have another noob question. Is it possible to make the Soarer's converter out of Arduino? I noticed that everyone is opting for Teensy but I was offered an Arduino Due as a gift and was wondering if I can make Soarer's out of it. I recently found two XT keyboards and would like to use at least one of them. marijan wrote: ↑ Hi, I have another noob question. Is it possible to make the Soarer's converter out of Arduino? I noticed that everyone is opting for Teensy but I was offered an Arduino Due as a gift and was wondering if I can make Soarer's out of it. I recently found two XT keyboards and would like to use at least one of them. No, it's not possible to run Soarer's converter on an Arduino Due. Soarer's converter is for 8-bit AVR microcontrollers, and the Arduino Due has a 32-bit ARM microcontroller. @fohat: Nice collection of enclosures! Thanks for the link to one of them -- this could save time spent in searching. Lately, I have mostly been going with internal converters -- putting them inside the keyboard case and installing a panel mount connector on the case for a detachable cable. However, sometimes it is more convenient to have an external converter, which has the added bonus of being able to use it with more than one keyboard. Speaking of which, I like the converter box that Muirium made with multiple connectors and a selector switch -- nicely retro and functional to boot. I have a keyboard with XT/AT (Not sure which one). Given that I have a PS/2 to USB soarer converter, will it work if I plug a cheap passive XT to PS/2 converter to a PS/2 to USB soarer converter? Or do I have to make another soarer converter for XT ? It should work without any issues. alh84001 wrote: ↑ It should work without any issues. Thank you for confirming, I'll just get an adapter than. Do you know if there's any simple way of telling an XT connector from a AT connector, perhaps judging from the date of production? Relatively new keyboards should be AT right? Somehow my F122 wont connect anymore to my PC. Has someone an idea to fix it? Interestingly xwhatsit controllers in Model Fs are working without any problem..
Wow, your firmware really rocks, very easy to get it running and seems solid as a rock. Is there a possibility to add ps/2 mouse/trackpoint support? Or is it already included and i weren't able to C? @pfoff, it won't happen, Soarer has abandoned the community and the converter. It's also closed source. No features or fixes will be happening... We really need a replacement. Has it been improved recently? I remember reading (probably in this thread) that xt conversion in tmk "is unusably slow". I didn't experience that. I used it about 6 months ago and it worked fine, but then I swapped to Soarer's converter for the ability to have different remaps per keyboard. I'd be interested to see the post that you mention. Well, I figured it out myself finally except for one minor problem. The "tilde" key isn't working. Everything else is. Any ideas? jimp124 wrote: ↑ Well, I figured it out myself finally except for one minor problem. The "tilde" key isn't working. Everything else is. Any ideas? I will sell you a replacement switch for $1 + postage in the US if it is a switch problem. NMB Hi-Teks are notoriously fussy and hard to work with. Pulling a key cap without also getting the under-skirt is not easy, and putting it back together without bending the tiny "fingers" of the leaf assembly is also a trick. Lastly, de-soldering is a problem because instead of "pins" there are 4 wires without any real strain relief. I just downloaded Soarer_Converter_v1.12_docs.zip because I am planning on making a converter for my IBM model F AT, but the images in the documentation was broken(Not showing). I therefore tried to downloading it on another computer, maybe thought this weirdely enough had something to do with the fact that I run Linux on my main PC, but I then encountered the same problem. Have anyone else encountered this issue? EDIT: I found out that the issue only occured when I opened the html file directly from the zip file without extracting it first. So it wasn't really an issue. I'm remapping that key with EUROPE_1. There's a chance that there's some other way to do it, but it works for me.